Review anything about the Corvette and you’re bound to offend someone for omitting an important point. Such is the strength of this iconic model — nay, brand — that has no lack of followers or at least enthusiasts who immediately become giddy when you offer them a ride. I’ve had my share of sports cars wind through my press fleet over the years, including the Nissan GT-R, Jaguar F-TYPE, Lexus RC F, BMW M6, Porsche 911 4S, and the Porsche Cayman. Not one of these models stoked the same level of interest as the Corvette from people who know me, but that doesn’t mean the preeminent Chevrolet product is the best of the lot. 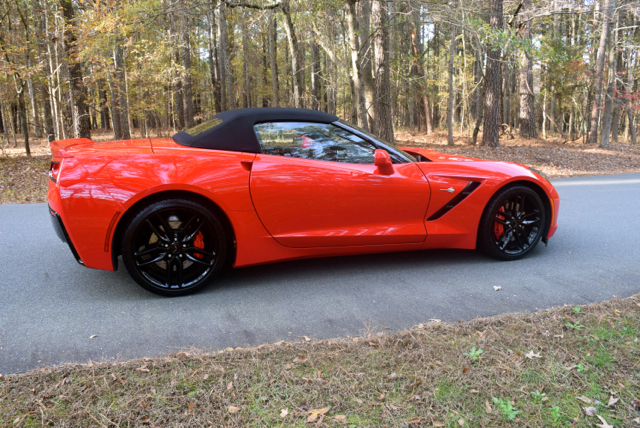 What Corvette represents is the most recognized and attainable model of the group. Further, nearly everyone has a story about a friend’s Vette or a movie that they saw or some other life experience involving this sports car. 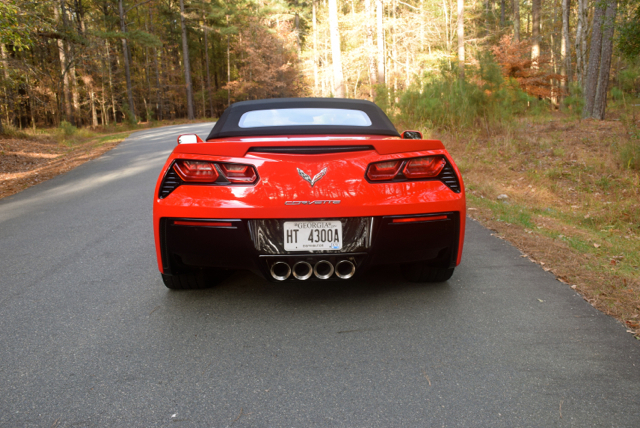 Quite frankly, the Corvette represents the warp and woof of the American performance machine. 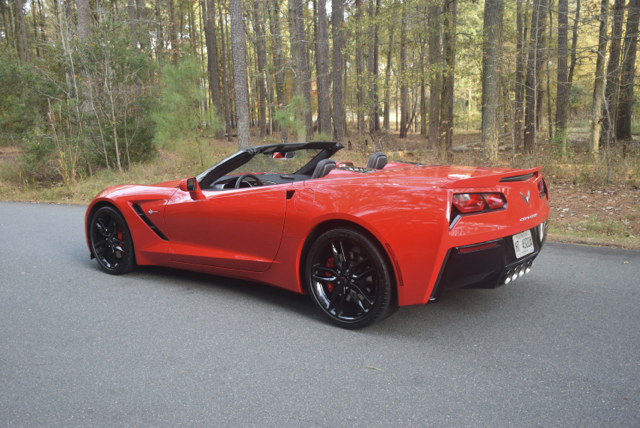 Instead of rehashing the usual comments about the Corvette’s look, drive, and feel, we’ll examine some of the more noteworthy attributes of this model. 1. Make it a Stingray. 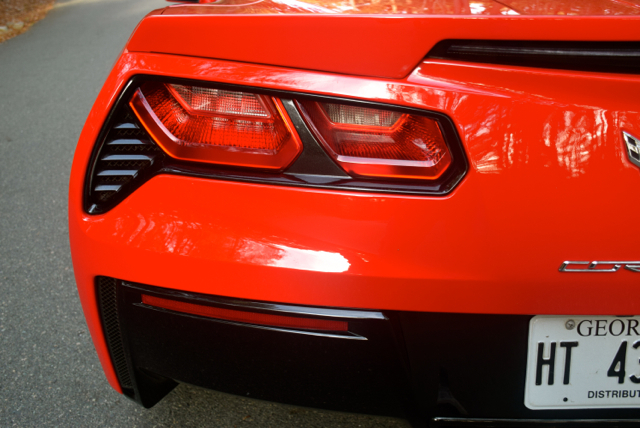 Currently in its seventh generation, this halo Chevrolet model is officially known at the Corvette Stingray, the first time the dual appellation has been used in nearly 40 years. Introduced in 1953, it has remained in production ever since, although no 1983 model was manufactured. Always available as a coupe, no convertible model was built from about the mid-1970s to the mid-1980s. 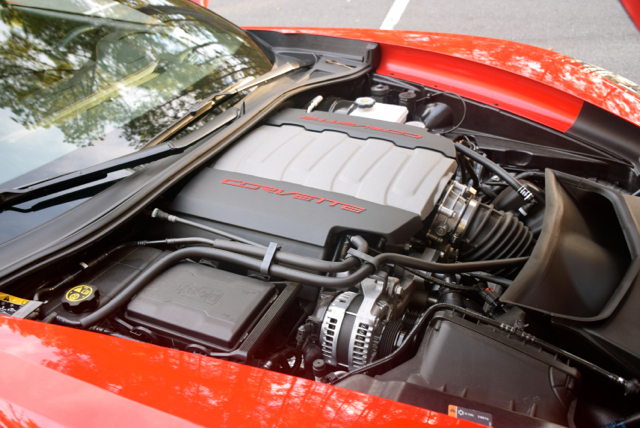 By the way, the supercharged model is known officially as the Corvette Z06. So, call the entire family “Corvette” and you wouldn’t be wrong. Beyond its high-end performance capabilities, the Corvette Stingray is an engineering dream come true, even in the little things. Take the convertible top, please! The test model, delivered in torch red paint, was a convertible with a black roof matching the other blackened highlights — that is, on the hood vent, wheels, side vents, around the tail lights, and on the diffuser. The best part of the roof is that you don’t have to do much of anything except press a switch located to the left of the steering wheel on the lower dashboard. No clamps to deal with and no adjusting the trunk (unless you have something sitting in the trunk). The roof automatically retracts, folds and hides within the trunk, getting the job done in about 20 seconds. Reverse the switch when you’re ready to close up shop and the trunk lid lifts, the roof emerges, unfolds and secures itself in position. An electronic notice on the dashboard confirms when everything has been securely put in place. 3. Shifting Has Never Been Easier. I cut my driving teeth on manual transmissions and have driven my share of stick-shift models through the intervening years. But there isn’t a smoother and cleaner shifting manual gearbox than what is present in this model. Seven forward speeds — count ‘em! — and you have much to play with. You have to try hard to grind the gears, but even then the clutch seems to compensate and finish the job for you. If you are prone to do as I do on occasion — such as jump from second to fifth gear — the gear number is displayed within the instrument panel, essentially reminding you to make an adjustment. Personally, I could do with five and am happy with six forward gears, but the seventh gear enables this hot performer to make 29 mpg on the highway — the same strong number put up by the 8-speed automatic. For the record, I averaged 23.9 mpg covering 232 miles of local and highway driving. 4. The Z51 Performance Package Nails It. 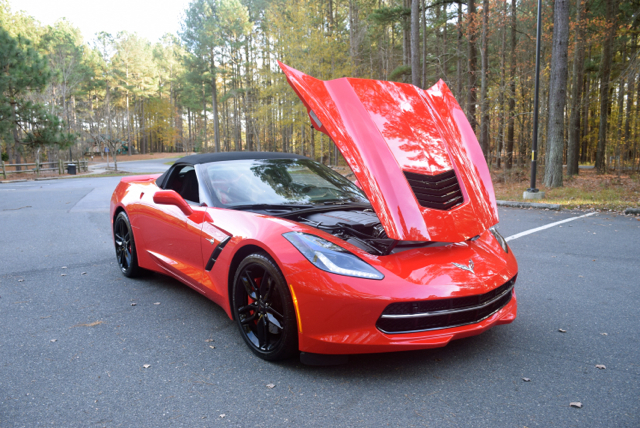 There is the Corvette Stingray and then there is the Corvette Z06. 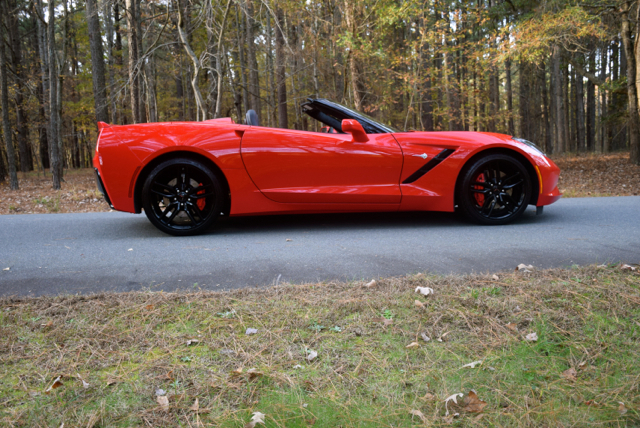 In the middle of the pack is the Corvette Stingray with its Z51 performance package, what delivers many of the amenities of the supercharged model, but without the blistering performance. The Z51 performance package brings an adaptive control system to manage the dampers, making multiple adjustments per second. Add in a set of larger wheels, high performance tires, and the available magnetic ride control package and you have a machine that behaves as you see fit. Indeed, the drive mode controller provides five modes — weather, eco, tour, sport and track — to suit your mood with steering, throttle and stability control adjusted accordingly. I stayed in Sport mode for nearly the entire time I had the sports car, enjoying the wheels slipping underneath as I took even the most standard turns. 5. Just Bathe Me In Comfort. 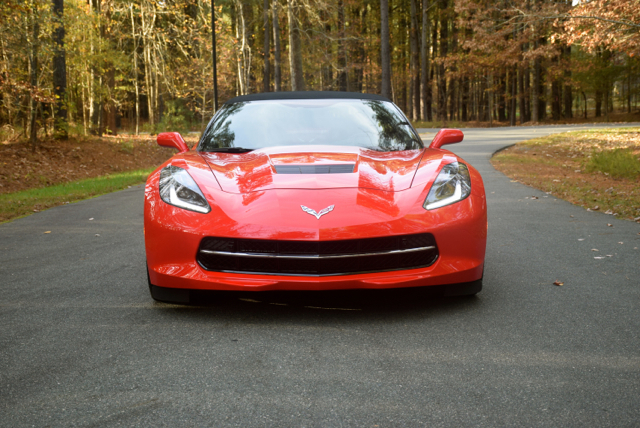 Whoever said that your Corvette Stingray has to leave you feeling stiff after a long drive? With most owners being “of a certain age,” having access to key features in a bid to ease the discomfort inherently felt when driving such models is a must. That’s where the 3LT preferred equipment group package ($9,745 option) comes in. 3LT provides seat adjusters with power bolstering and lumbar support. You also get heated and ventilated seats, Napa leather inserts, power heated side mirrors, a premium Bose audio system, and an upgraded theft deterrent system. Curb view cameras and a color head-up display are also included. 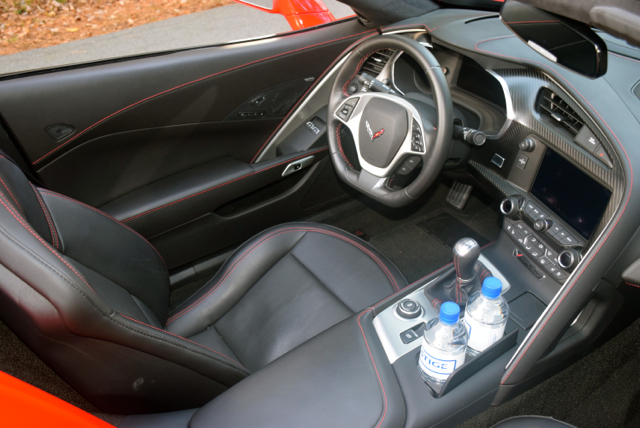 Thus, the Corvette Stingray is not simply a machine — it is a technological beast, but without the distracting and cluttered instrument panel and console. 6. Connectivity Features are Welcome. 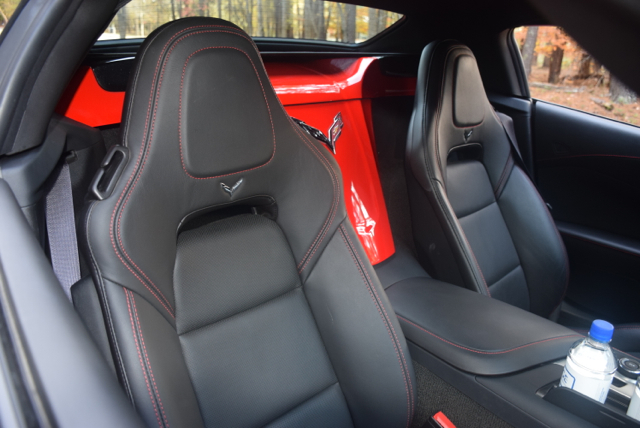 Long-time Corvette fans may not care as much about today’s technologies, nevertheless such amenities are a welcome feature and are now part of the Corvette Stingray experience. Not only does this sports car serve up an 8-inch color display, but it does so with the very usable Chevrolet MyLink telematics system. Among the features present are: Bluetooth connectivity, Apple CarPlay with smartphone compatibility, SiriusXM satellite radio, 4G LTE Wi-Fi hotspot, and a wholly beneficial navigation system. 7. Everything Else Really Doesn’t Matter Much. So, what have I left out? Comparatively minor details such as the body’s form, trunk space, and the delicious quad pipes. But those are matters I’ve covered before and you probably have heard about ad nauseam. Of course, the convertible supplies you with a proper trunk, while the hardtop delivers what amounts to a hatchback. 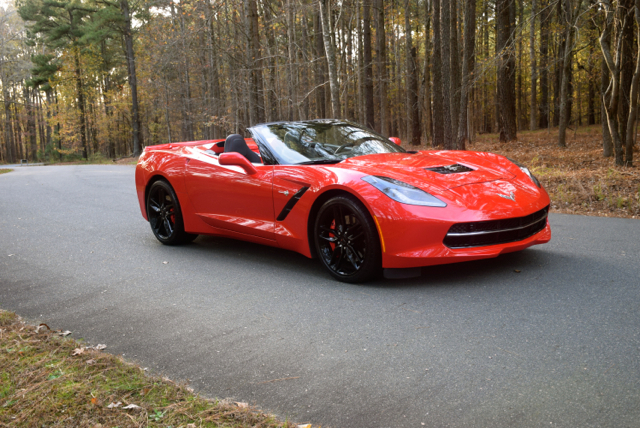 In the sport car matrix, the Corvette holds its own. Importantly, more than six decades after its release, the legend continues and quite easily this one may be the best of the seven-generation lot.